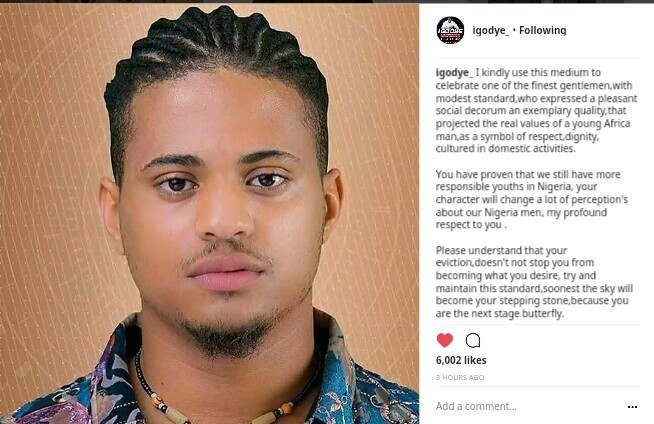 Following the sudden eviction of one of Big brother naija housemate, Rico Savey, who left the big brother's house last Sunday during the Live eviction show, Nigeria multi award winning ace comedian, IGoDye has taken to his social media page to rain encomium on Rico Savey. IGoDye decribe Rico Savey as one of the most finest gentleman that has ever walked the surface of the earth with the modest of character. Apart from being such a perfect gentleman, He added that Rico is the true definition of a young Africa man and promises to help him out in setting up his restaurant business. I kindly use this medium to celebrate one of the finest gentlemen,with modest standard,who expressed a pleasant social decorum an exemplary quality,that projected the real values of a young Africa man,as a symbol of respect,dignity, cultured in domestic activities. 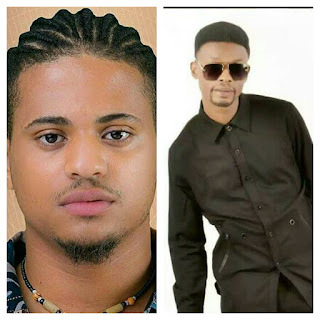 You have proven that we still have more responsible youths in Nigeria, your character will change a lot of perception's about our Nigeria men, my profound respect to you . Please understand that your eviction,doesn't not stop you from becoming what you desire, try and maintain this standard,soonest the sky will become your stepping stone,because you are the next stage butterfly. I shall continually celebrate anyone with your kind of remarkable character and humane attitude of purpose. congratulations.